At secondary school, I was extremely interested in electronics. After 1.5 years studying electrical engineering at a university of applied sciences, I realized I needed more of a challenge. I went to a couple of university Open Days and at Twente I certainly found the extra challenge I was looking for. The relatively small-scale nature appealed to me. There’s no danger of getting lost in the crowd here. There is a great atmosphere and people are very sociable. The University of Twente has social studies as well as science and engineering, so there’s a good mix of students. One of the coolest things is that you can directly apply the knowledge you acquire from your first year on. 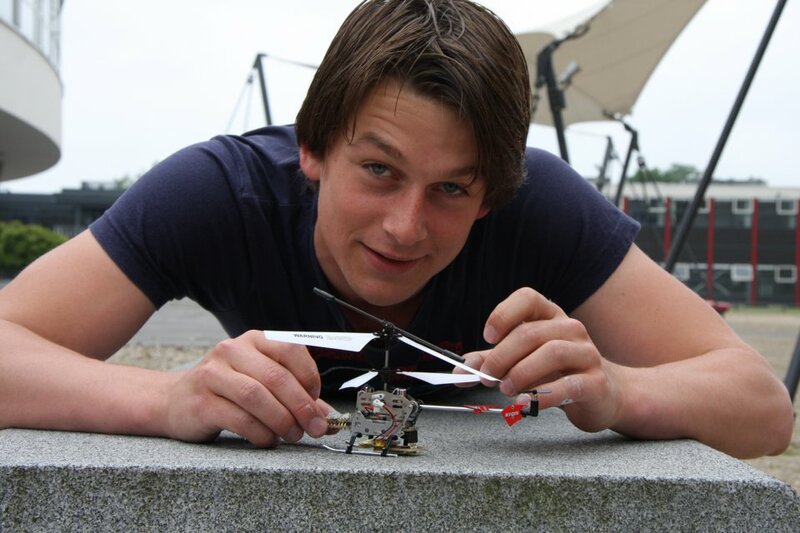 With my project group I even built a remote-controlled helicopter you can operate with a mobile phone. Now I'm designing a camera monitoring system for athletes, so they can improve their technique without the help of a trainer. It’s a tough programme with lectures, tutorials and independent studying throughout the day, but if you are motivated and willing to work hard, you’ll get there. I look at the world differently now and I understand what’s going on so much better. In addition to electrical engineering, you also learn about mechanics, which interests me very much. I’m busy with my studies during the day. It’s a full-time programme, so you are at uni for lectures, tutorials or practicals from 8:30 to 17:00. Lecturers explain the subject in class and since the groups are relatively small, there’s plenty of opportunity to ask questions. A lecture is often followed by a tutorial where you study what you have just learned on your own so you really get a feel for it. In the practicals and projects, you directly apply what you have learned and try to work out why certain calculations don’t pan out in practice. If you don’t have any classes, you can study on your own (at home or at university). I try to keep my evenings free for fun stuff. How would you describe student life in Enschede? Enschede is a fun, compact, easy-going university town. I didn’t think much of the place before I started studying here, but I’ve changed my mind completely! You always run into somebody you know when you go out. I moved into a student flat in the centre of Enschede with five other flatmates to cut down on travel time. Unless I’m out in the evening, we usually eat together. It’s nice not to have to cook for myself every day! I have started a company with an Industrial Design Engineering student. It’s interesting and I’m learning a lot, because you have to think about exactly what the product will look like, if it can be reproduced, how much time it takes to make and how much it costs. All vital stuff if you want to market a product! When it’s windy enough, I go windsurfing or otherwise I go wakeboarding. I’m a board member of the student sports association in Enschede. In the summer, I often go on a road trip/surf trip and in the winter we go skiing. I was the president of the association for a year, which was a useful and enjoyable experience. I learned how to draw up a policy plan with a team, and sometimes I had to chair meetings with over 30 participants.